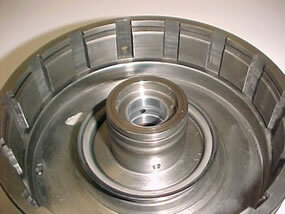 4L80E Forward Drum Repair from Omega Machine & Tool Inc.
4L80E drums require a good sealing ring area for good apply. A ring cut drum is a smoked drum. Omega Machine & Tool, Inc repairs the drums with a steel sleeve, restoring the sealing area to like new condition and maintaining OEM dimensions. Original sealing rings are used. Why cause a potential headache for the next guy that rebuilds this unit? In addition to repairing the ring cut damage on the drums we have developed a wider bronze bushing to increase support for the input shaft, part number 33438. See comparison between OEM bushing and ours.